These days, manscaping isn’t the punchline it used to be. In fact, it’s become a major part of the male grooming routine just as much as beard trimming, showering and wearing deodorant. Men these days have realized that they no longer have to put up with unwanted hair—but some ways of getting rid of overgrown fur are better than others. Here is a look at the five best body groomers you can use to tame that full body mane of yours into submission. Philips has gone and created one of the best electric body groomers on the market. This well-reviewed piece of body care genius is designed with full-body manscaping in mind. With its swiveling attachment, men can easily slide dual-sided blades across their body–eliminating a significant amount of hair in a minimal amount of time. Additionally, there are attachments topped with foil for close-shaving action, as well as a solid lineup of trimmers with their unique function–cutting through coarse, dense hair, curly wisps or areas that need to be treated with a bit more sensitivity. Sure, this attractive option comes with a ton of attachments and is sure to take up an enormous amount of room in your bathroom cabinet. But–this product has excellent reviews, and the multifunctionality makes this product a worthy investment. Whether you’ve got a date in an hour or you’ve got to get to work ASAP, Braun’s body groomer makes short work of excess hair, with its extra wide shaver head and flexible foil cover. It even works both in and out of the shower, so you can groom and shampoo in one fell swoop. If you need more precision, that’s covered, too. A variety of combs lock in place, and the trimmer is twistable—meaning you can easily define edges of your beard or other areas—keeping the hair you want looking sharp. One of the best body groomers around, Man Groomer’s Ultimate Pro does what it sets out to do—its built for taking on a copious amount of male hair. This product is built for the twists and turns a successful body groomer needs to cover a lot of ground quickly and includes a wide shaving attachment that can bend up to 135 degrees in any given direction. Basically, this is a solid option for back hair. With its rubber grip and patented hinging capability, this groomer can bend at any angle you need, securely locking into place. This unique feature helps you get hard to reach areas without contorting your body every which way—or god forbid, asking a buddy for some assistance. Once you’re done wiping out large patches of hair, a smaller attachment can come in and do the detail work. The smaller attachment works great for beard trimmings or pubic areas, too—you’re not just relegated to the back area. What we really like about this body groomer is, it’s got a quick charge feature—so, should worst case scenario—your groomer runs out of juice while you’ve still got half a beard, you won’t be stuck waiting for it to charge. Made from steel blades that self-sharpen, this is a shaver/trimmer that can do it all. It’s designed more so more cleaning up hair and DIY trims, rather than providing a full-on clean shaven face. This comprehensive set comes with eight attachments–the requisite neck and sideburn trimmer, a wider one for body hair and a foil attachment for silky smooth skin.Additionally, there are more attachments for those smaller details that add up–you know ear and nose hair and other, miscellaneous crevices. Sure, you might not need all the various add-ons, but it’s a good idea to be prepared for anything. The Remington model is great, as it gives you multiple options for tackling an area of the body with a broad brush, or with a gentle, detail-oriented approach. And, as if there weren’t enough reasons to love this multitasking groomer– it’s waterproof and decked out with a rubber handle. Meaning, you can bring this bad boy into the shower for easy grooming. Rounding out the list of best body groomers is something a bit different. What’s not to love—Gilette’s travel-sized manscaping tool goes wherever you need it to go—fitting into teeny tiny travel kits as needed. While this option doesn’t come with quick charge or, sadly, even rechargeable batteries—AAs it is—it’s waterproof and perfect for doing little touch-ups in the shower. This tool works well when it comes to removing unwanted hair here and there, but it’s not designed for the more hirsute among us. Thicker pubic hair or dense beards may get stuck in the blades. Users may want to try trimming hair with shears before using on coarse or thick hair. What’s cool about this little grooming tool is, it’s water resistant and may be used as easily in the shower as it can for dry touch ups here and there. Its small size makes the Gillette easy to control–it’s got a comfortable grip and can easily maneuver around smaller patches of hair. And while this product is marketed more as a grooming tool, it comes equipped with Gillette’s sharpest blades. Ideal for sensitive skin, as well as getting a close shave. Look, whether you decide to go all out and ditch a full body’s worth of hair, or need a trim here and there, you’ll want to have all the right tools on hand. Some men rely on basic razors and scissors to get the job done sacrificing precision–but may be more susceptible to irritation. Be sure to moisturize and change blades regularly for best results. 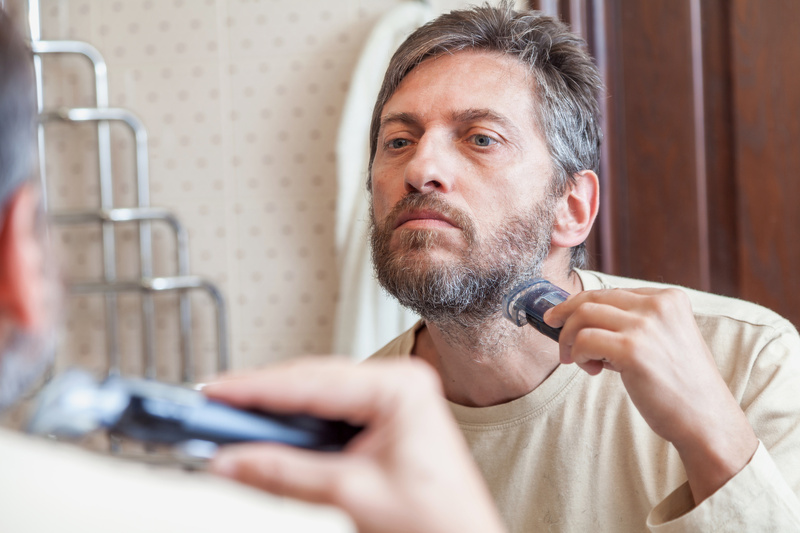 For more information on the ins and outs of male grooming, check out Beard Trimmer Reviews.